The process to organize data and create reports is designed for maximum flexiblity. The blue blocks are processes that the user initiates: 2. Data Collection and 7. Reporting. For more information check our screen prints. The red blocks are documents that are provided with APAS/Wizard. The yellow blocks are output of APAS/Wizard. They can be distributed by users. Document 4 contains both a copy of the protocol definition (the "questions") as well as the data (the "answers"). It is self-contained and can be run in any other APAS/Wizard, even if it does not contain the same protocol definitions. Document 13 is the final report. Note that you should really only concerned with the user processes in blue, and the output documentsin yellow . 1. Protocols.xml Protocols.xml is a file (database) that contains all the "recipes" for data collection. These recipes determine what kind of questions APAS/Wizard will ask (e.g. text input, options, date, pictures, kinematic data, kinetic data, etc. ), including their default values. Data Collection APAS/Wizard will step the user through the protocol as defined in 1. It can be as simple or as complex as the designor of the protocol wants. See the screen shots for more information. 3. Database.xml Both local files and a list of the online database is contained in these data files. Actually it consists of two files, db_local.xml (which will be filled by APAS/Wizard), and db_online.xml which will be updated automatically when connecting to the server. The online database is nice in that it will allow users to compare their own data to anything available in the database. 4. Analysis.xml This document contains both a copy of the protocol definition (questions) as well as the data (answers to the questions, including defaults). It is self-contained and can be run with any APAS/Wizard. 5. Data files Data files necessary for analysis and reporting (APAS 3D and CF files, APAS ANA files, JPG pictures, and in the near future perhaps also video files. These data files form an integral part of both output documents (4 and 13) since they contain references to them. Additionally, APAS/Wizard will create png files with charts. Report definition Internal: this is a document that determines which elements go into a report. Note that the protocols, data, and reporting definitions are separated. This means that we can generate different kinds of reports on the same data files without having to change the underlying data. Reporting The user decides when to create which report. Data Content - Behind the scenes, APAS/Wizard will create a report contents based on two documents (4 and 6). 10. 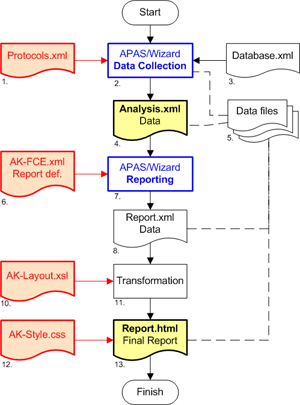 AK-Layout.xsl Layout - These types of files determine how the contents of report 8 will be visualized by transforming the contents into some other content (in this case HTML). We may include other formats like PDF in the future. Generated on 4/20/2019 3:46:40 PM (PST) ADI/HQ/GBA/2019/ARIELCLOUD/v3.0.2018.0126.